Bacterial spillage into a sterile environment following intestinal hollow-organ perforation leads to peritonitis and fulminant sepsis. Outcome of sepsis critically depends on macrophage activation by extracellular ATP-release and associated autocrine signalling via purinergic receptors. ATP-release mechanisms, however, are poorly understood. Here, we show that TLR-2 and −4 agonists trigger ATP-release via Connexin-43 hemichannels in macrophages leading to poor sepsis survival. In humans, Connexin-43 was upregulated on macrophages isolated from the peritoneal cavity in patients with peritonitis but not in healthy controls. Using a murine peritonitis/sepsis model, we identified increased Connexin-43 expression in peritoneal and hepatic macrophages. Conditional Lyz2cre/creGja1flox/flox mice were developed to specifically assess Connexin-43 impact in macrophages. Both macrophage-specific Connexin-43 deletion and pharmacological Connexin-43 blockade were associated with reduced cytokine secretion by macrophages in response to LPS and CLP, ultimately resulting in increased survival. In conclusion, inhibition of autocrine Connexin-43-dependent ATP signalling on macrophages improves sepsis outcome. Sepsis is associated with high mortality and was now recognised as a Global Health Priority by the World Health Organization (Reinhart et al., 2017). Mechanistically sepsis is characterised by a dysregulation of the host immune response to bacteria resulting in local and systemic exacerbated pro-inflammatory response and a concomitant protracted anti-inflammatory response (Delano and Ward, 2016; Hotchkiss et al., 2013). Accordingly, immuno-regulatory drugs have been considered as a potential treatment, however, clinical results have been unsatisfactory so far (Remick, 2003). Despite the urgency to improve patient outcomes and major advances in the understanding of sepsis, a specific therapy is still lacking. Peritoneal sepsis, as a result of a hollow-organ perforation, is typically associated with invasion of the peritoneal cavity by gut contents containing intestinal bacteria. Intestinal commensals and pathogens proliferate then in the peritoneal cavity and release pathogen associated molecular patterns that interact with pathogen recognition receptors on local macrophages and neutrophils to initiate strong inflammatory reactions (Iwasaki and Medzhitov, 2004). Macrophage activation is critically modulated by extracellular ATP and associated purinergic signalling via autocrine/paracrine mechanisms (Idzko et al., 2014). During sepsis, purinergic signalling regulates core inflammatory cell functions such as migration and inflammatory mediators production (Idzko et al., 2014; Ledderose et al., 2018; Ledderose et al., 2016). ATP depletion or blockade of purinergic receptors were shown to increase survival and improve outcome of sepsis in rodent models (Cauwels et al., 2014; Csóka et al., 2015). The initiating event triggering purinergic signalling is the release of extracellular nucleotides and includes active vesicular and channel-mediated release in addition to the passive release from necrotic cells (Dosch et al., 2018). Active ATP release from inflammatory cells can occur both via vesicular exocytosis or via connexin or pannexin hemichannels, mainly Connexin-43 (CX43) and pannexin-1 (Dosch et al., 2018; Junger, 2011). In sepsis, it is still unknown which mechanisms mediate ATP release and if targeting these mechanisms would impact outcomes. In addition, it remains to be described which inflammatory cells are involved in ATP release and to what extend ATP determines autocrine/paracrine inflammatory cell regulation during sepsis. By screening release mechanisms of ATP using small molecule blockers, we have identified CX43 to be critical in peritoneal sepsis. CX43 is a gap junction protein forming either gap junctions or hemichannels and has been shown to mediate ATP release from inflammatory cells including macrophages (Csóka et al., 2015; Kang et al., 2008). CX43 full knockout is perinatally lethal in mice due to cardiac malformation (Eckardt et al., 2004; Liao et al., 2001). Thus, in order to specifically explore the function of CX43 on inflammatory cells, we developed a conditional MAC-CX43 KO mouse (Lyz2cre/creGja1flox/flox), in which CX43 is specifically deleted on macrophages and neutrophils. We identified that peritoneal macrophages express high CX43 levels in mice and humans and that CX43 expression on macrophages critically controls ATP release, local and systemic inflammation, and ultimately survival in a model of abdominal peritonitis via the purinergic receptor P2Y1. Our findings suggest that CX43 represents a new potential target for sepsis therapy. 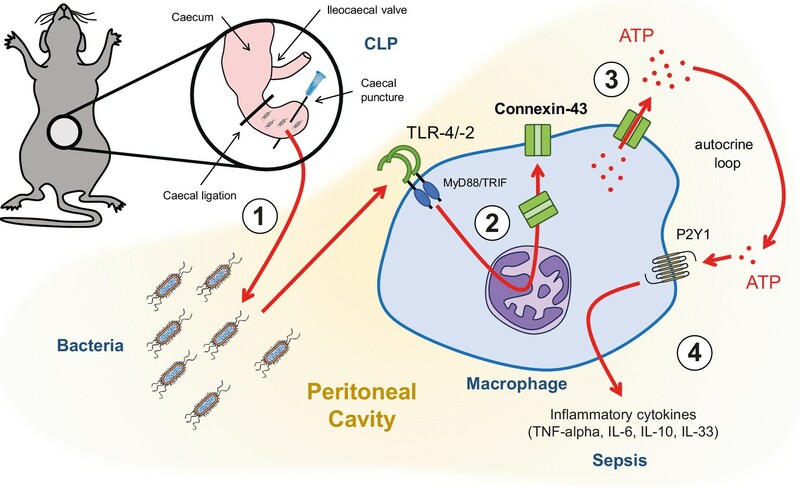 Inflammatory cell populations present in the peritoneal cavity during peritonitis were characterised using CLP as a murine model of peritoneal sepsis and include infiltrating small peritoneal macrophages (SPM) and resident large peritoneal macrophages (LPM) (Ghosn et al., 2010; Wang and Kubes, 2016). Ten hours after CLP, SPM populated the peritoneal cavity while the fraction of LPM disappeared (Figure 1A–B, Figure 1—figure supplement 1A–B). Additionally, two large populations of neutrophils invaded the peritoneal cavity upon sepsis while dendritic cells disappeared. Given the observation that SPM specifically populate the peritoneal cavity after CLP, we tested the ability of macrophages to secrete ATP. Isolated C57BL/6 wild-type (WT) peritoneal macrophages actively released ATP in response to TLR-4 agonist LPS (1 μg/ml) as well as the TLR-2 agonist Pam3CSK4 in a dose-dependent manner (Figure 1C–D). ATP released in the extracellular space was promptly degraded by ecto-nucleotidases, as lower levels of extracellular ATP were observed in absence of treatment with ARL67156 trisodium salt, an ecto-ATPase inhibitor (Figure 1—figure supplement 1C). Small peritoneal macrophages release ATP during sepsis via Connexin-43 hemichannels. (A) Intraperitoneal cell fractions characterised by flow cytometry in controls (green) and 10 hr after caecal ligation and puncture (CLP, orange) in a tSNE plot of viable (AmCyanlow) CD45high cells. Populations were defined based on F4/80 (BUV395), CD11b (APC/Cy7), Ly6G (PE-Cy7) and CD11c (Pacific blue). In response to CLP, elevated levels of neutrophils (1)/(2) (F4/80low, CD11bhigh, Ly6Ghigh) and small (infiltrating) peritoneal macrophages (3) (F4/80int, CD11bint) were observed but not large (resident) peritoneal macrophages (4) (F4/80high, CD11bhigh) or dendritic cells (5) (F4/80low, CD11blow, Ly6Glow, CD11chigh) (N = 5 animals per group). (B) Relative frequency of large (resident) peritoneal macrophages (LPM) and small (infiltrating) peritoneal macrophages (SPM) in the peritoneal cavity of controls (green) and 10 hr after CLP (orange) (N = 5 animals per group, one-way ANOVA). (C) Extracellular ATP levels in the supernatant of peritoneal macrophages after 30 min stimulation with LPS (TLR-4 agonist) or Pam3CSK4 (PAM, TLR-2 agonist). Cells were isolated from C57 Bl/6 WT mice (each dot is representative of an independent biological replicate, representative of more than five independent experiments, unpaired t-test). (D) Dose-dependent ATP release by peritoneal macrophages in response to LPS as quantified by a luciferin-luciferase assay (N = 12 (control) and 6 (LPS))*. (E) LPS-induced ATP release by macrophages can be blocked by carbenoxolone ((Carbeno) combined pannexin/connexin blockade), 18-alpha-GA (18-a-GA) global connexin blockade), Gap27 (specific blockade of Connexin 43 (CX43)) but not by probenecid ((Prob) pannexin channel blocker) and N-Ethylmaleimide ((NEM) blockade of vesicular exocytosis) (N = 10 (negative and positive controls) and 5 (blockers))*. (F–G) Non-specific (18-a-GA) and specific (Gap27) blocking of connexin hemichannels decreases LPS-induced ATP release from WT peritoneal macrophages in a dose-dependent manner (N = 12 (negative control) and 6 (treated groups), negative and positive controls were the same for both experiments)*. (H) LPS-induced ATP release from WT compared to MAC-CX43 KO peritoneal macrophages with and without specific CX43 blocking (N = 8)*. (I) LPS-induced ATP release has no impact on intracellular ATP levels (N = 8)*. *Data represent independent biological replicates, compared by unpaired t-test and are representative of three or more independent experiments. To screen cellular mechanisms underlying LPS-induced ATP release, specific blockers of (hemi)channels and vesicular exocytosis were administered (Figure 1E). LPS-induced ATP release was blocked by carbenoxolone (combined pannexin/connexin blockade), 18-alpha-GA (global connexin blockade) and Gap27 (blockade of Connexin-43 (CX43)) but not by probenecid (pannexin channel blockade) and N-Ethylmaleimide (blockade of vesicular exocytosis) revealing a specific role of CX43 (Figure 1E). The relevance of CX43 is substantiated by dose-dependent unspecific (18-alpha-glycyrrhetinic acid) and specific (Gap27) CX43 blockade (Figure 1F–G, Figure 1—figure supplement 1D). To understand the importance of CX43 in ATP release from macrophages and its impact on macrophage activation, we developed conditional MAC-CX43 KO (Lyz2cre/cre, Gja1flox/flox) mice in which CX43 is specifically deleted in activated macrophages (Figure 1—figure supplement 2). As expected from the previous results using a specific CX43 blocker, ATP was released from WT peritoneal macrophages upon LPS stimulation but not from MAC-CX43 KO peritoneal macrophages, while intracellular ATP levels remained constant (Figure 1H–I, Figure 1—figure supplement 1E). In humans, fluids obtained from peritoneal lavage during abdominal operations were analysed by flow cytometry. CX43high macrophages were observed in the peritoneal fluid of patients with peritonitis but were not detected in patients without signs of intra-abdominal infection (Figure 2A–C, Supplementary file 1A). Connexin-43 expression is induced on macrophages in a MyD88/TRIF dependent manner. (A) Flow cytometry gating strategy for human inflammatory cells isolated from fluids obtained from peritoneal lavage during abdominal operations. Macrophages were defined as viable (AmCyanlow), CD45high, CD3low, CD19low, CD56low, CD11clow, CD16high and CD67low cells. (B) CX43 expression level on macrophages isolated from patients with peritonitis (red) compared to control patients (blue). (C) Percentage of CX43high macrophages in the peritoneal fluid collected from control patients without peritoneal inflammation (green) compared to patients with peritonitis (orange) (N = 5 patients in control group and N = 6 patients in peritonitis group, Mann-Whitney test). (D) Specific CX43 expression (Alexa Fluor 488) in macrophages (small and large peritoneal macrophages, SPM and LPM) among peritoneal viable (AmCyanlow) CD45high cells (N = 5 animals per group, tSNE analysis as described in statistical methods). (E–F) Increased expression of CX43 in peritoneal macrophages following stimulation with LPS (1 µg/ml) for the indicated time-points (Western blot: N = 2 independent biological replicates per time-point, quantification of immunoblots using ImageJ, unpaired t-test. Immunofluorescence: PE-Texas red = CX43; FITC = F4/80; blue = DAPI). (G) Abrogated CX43 protein expression in peritoneal macrophages from MyD88/TRIF double KO mice upon stimulation with LPS 1 μg/ml (N = 2 mice per time-point, quantification of immunoblots using ImageJ, unpaired t-test). (H) LPS-induced ATP release from murine WT compared to MyD88/TRIF KO peritoneal macrophages (N = 7 independent biological replicates, one-way ANOVA). (I) CX43 protein expression in peritoneal macrophages from caspase 1/11 double KO mice upon stimulation with LPS 1 μg/ml (N = 2 mice per time-point, quantification of immunoblots using ImageJ, unpaired t-test). Full uncut western blot membranes are available in Source data 1. In mice, analysis of cellular fractions present in the peritoneal cavity during peritonitis revealed that CX43-dependent ATP release is macrophage-specific, since both SPM and LPM are CX43-positive, while neutrophils are CX43-negative (Figure 2D). 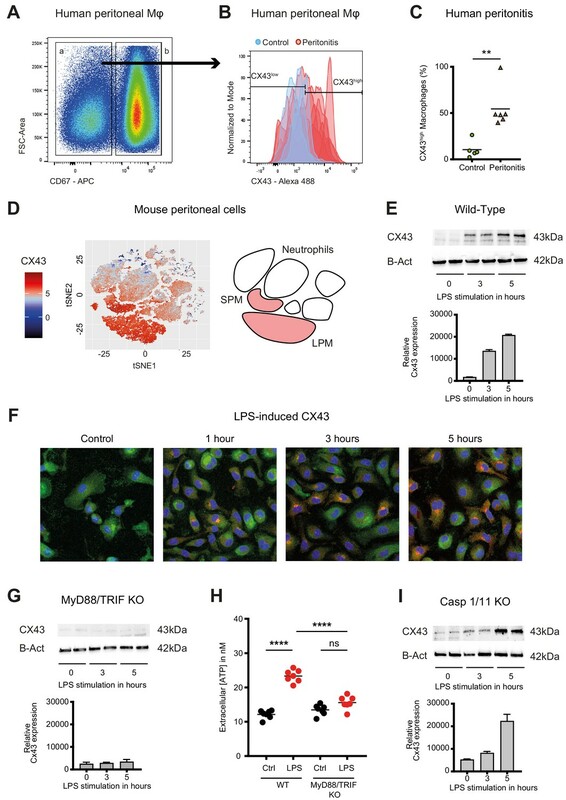 CX43 protein expression in WT murine peritoneal macrophages is induced by LPS (Figure 2E–F, Figure 2—figure supplement 1A–B). Mechanistically, MyD88 and TRIF are required for the expression of CX43 after LPS stimulation (Figure 2G–H), while it is independent of caspase-1 and caspase-11 (Figure 2I). Thus, CX43 in SPM is responsible for LPS-induced ATP release in peritoneal sepsis in a MyD88/TRIF dependent manner. Sepsis is a systemic inflammatory reaction that leads to extensive organ damage remote from the primary infection site, typically in the liver and the lungs. To understand whether CX43 positive macrophages would be present locally at the site of infection only or in remote organs as well, we analysed hepatic and pulmonary tissues in our CLP model. In the liver of controls, CX43 was expressed mainly on parenchymal cells including cholangiocytes, while after CLP it was highly upregulated on infiltrating cells in a time-dependent manner (Figure 3A–B, Figure 3—figure supplement 1A). CX43 protein expression in the liver was dependent on MyD88/TRIF activation (Figure 3C). Following CLP, infiltrating macrophages and neutrophils increased in the liver while resident macrophages (Kupffer cells) remained constant (Figure 3D–E). CX43 expression in the liver was restricted to infiltrating macrophages, while neutrophils and resident macrophages were CX43 low (Figure 3F). Hepatic lympho-cellular populations, such as T cells, B cells, and NK cells did not express CX43 (Figure 3—figure supplement 1B–D). Connexin-43 expressing macrophages are recruited systemically during sepsis. (A) Elevated CX43 protein expression in the liver 5 and 10 hr after CLP compared to controls (N = 3 animals in each control group from the gels at 5 hr and 10 hr, all used for the calculation of the histogram) and N = 6 animals for each time point, unpaired t-test). (B) Elevated expression of CX43 on non-parenchymal cells in the liver 10 hr after CLP compared to controls. (C) Abrogated CX43 protein expression in the liver of MyD88/TRIF double KO mice 10 hr after CLP (N = 2 mice per group, unpaired t-test). (D–E) Following CLP (orange), neutrophils (1) and infiltrating macrophages (2) increased in the liver, while resident macrophages (3) remained constant compared to controls (green). (F) Infiltrating macrophages highly expressed CX43 levels while neutrophils (1) and resident macrophages (3) were CX43 low (N = 3 animals in control group and N = 6 animals in CLP group, unpaired t-test). 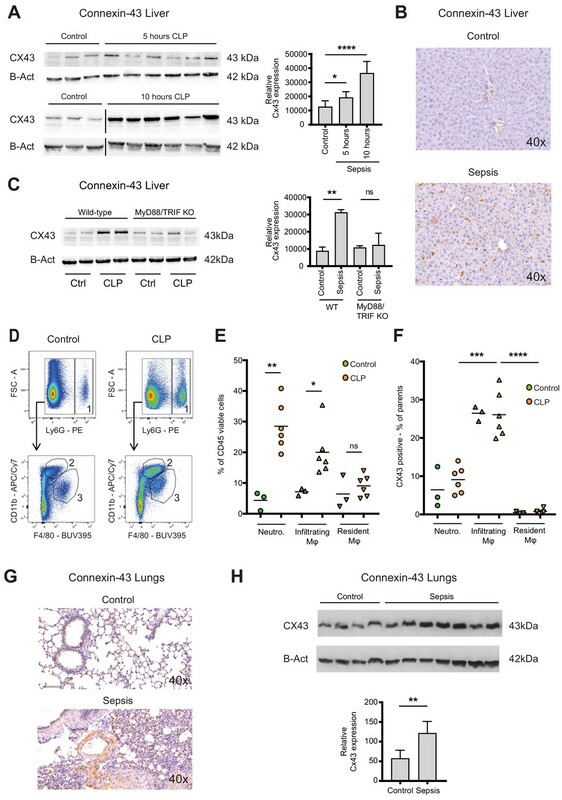 (G, H) Elevated expression of CX43 on non-parenchymal cells in the lungs in response to CLP compared to control mice (N = 4 animals in control group and N = 7 animals in CLP group, unpaired t-test). Full uncut western blot membranes are available in Source data 1. In the lungs, CX43 is constitutively expressed on muscle cells and resident macrophages populations (Figure 3G). In the acute respiratory distress syndrome that is associated with severe peritonitis, alveolar infiltration of CX43 inflammatory cells was observed (Figure 3G–H). These results reveal that CX43 expression is increased in the liver and lungs as remote target organs during sepsis. Levels of extracellular ATP were increased in the peritoneal cavity as well as in the systemic circulation 10 hr after CLP (Figure 4A–B). Following CLP, we observed lower systemic ATP levels in MAC-CX43 KO mice compared to the WT mice, suggesting a role for CX43 in systemic ATP release, supporting the results in Figure 1 showing that local ATP release from macrophages is CX43-dependent (Figure 4B). In a next step, we assessed autocrine responses of CX43-dependent ATP release in peritoneal macrophages. Pharmacological blocking (Gap27) or genetic deletion of CX43 decreased pro-inflammatory cytokines levels (TNF-alpha and IL-6) after 3 and 6 hr of LPS stimulation in peritoneal macrophages in vitro (Figure 4C–D). Gap27 decreased TNF-alpha levels after 6 hr LPS-stimulation and IL-6 levels after 3 hr LPS-stimulation. Next, we aimed to understand whether CX43 blocking or deletion, and consequent decrease in ATP release, regulate macrophage differentiation. Functional markers of M1 differentiation, such as Inos and Il12rb, were decreased in peritoneal macrophages under CX43 blocking or deletion (Figure 4—figure supplement 1A–B), while markers of M2 differentiation, including Arg1, Tgfb and Il-10, were comparable among groups (Figure 4—figure supplement 1C–E). Phagocytosis of IgG coated latex beads was not impacted by CX43 blocking or deletion (Figure 4—figure supplement 1F). Therefore, autocrine CX43-dependent ATP signalling alters cytokine secretion and drives M1 macrophage differentiation but not phagocytosis. Connexin-43-mediated local and systemic ATP release contributes to macrophage over-activation via P2Y1. (A) Extracellular ATP levels as assessed by luminescence of i.p. injected 5 × 106 HEK293-pmeLUC D-luciferin activated cells (in counts per second (cps)). Luminescence was significantly higher 10 hr after CLP compared to sham-operated controls. (B) Direct measurement of extracellular ATP in the plasma collected from vena cava inferior is elevated in response to CLP and higher in WT mice compared to MAC-CX43 KO mice (each dot is representative for a single animal, unpaired t-test). (C–D) Inhibition (Gap27 (1 µM)) or genetic deletion of CX43 decreased TNF-alpha (C) und IL-6 (D) secretion from peritoneal macrophages in response to stimulation with LPS (1 μg/ml) for 3 and 6 hr (removal of 7 outliers after ROUT test in Figure 4D)*. (E) IL-6 release was restored by activation of purinergic receptors by exogenous administration of ATPуS (10 nM) and abrogated in response to apyrase (100 IU/ml) (each dot is representative of an independent biological replicate, two-way ANOVA, representative of three experiments). (F–G) IL-6 release from peritoneal macrophages in response to LPS (1 µg/ml) and by blocking major P2X (G) and P2Y (H) purinergic receptors (N = 4)*. *Data represent independent biological replicates, compared by unpaired t-test and are representative of three or more independent experiments. To determine if cytokine secretion in response to abrogated ATP release after CX43 deletion can be reverted, ATPgammaS, a non-hydrolyzable form of ATP, was administered in vitro. Thereby the inhibited secretion of IL-6 by peritoneal macrophages was restored to control levels (Figure 4E, Figure 4—figure supplement 1G). Administration of apyrase, a soluble ecto-ATPase consuming extracellular ATP, decreased pro-inflammatory cytokines levels. Thus, the downstream effects of LPS-induced CX43-dependent ATP release is mediated via purinergic receptors. To identify specific P2 receptors responsible for this effect, a screen using different P2 receptors blockers was performed by measuring the effects of LPS-dependent TNF-alpha and IL-6 release from peritoneal macrophages (Source data 1). The observed reversal of TNF-alpha and IL-6 secretion following unspecific P2 receptor blockade (suramin) and specific P2Y1 blockade (MRS 2279) indicate a crucial role of P2Y1 in macrophage activation following LPS stimulation (Figure 4F–G, Figure 4—figure supplement 2A–B). Gene expression of purinergic ATP receptors (P2X and P2Y receptors) were not differently regulated between MAC-CX43 KO and WT (Figure 4—figure supplement 2C). Extracellular ATP is hydrolysed by the ecto-nucleotidase CD39 to ADP/AMP and by ecto-5’nucleotidase CD73 to adenosine. CD39 mRNA levels were reduced in response to CX43 pharmacological blockade or genetic deletion in MAC-CX43 KO peritoneal macrophages compared to WT controls, while no difference between WT and MAC-CX43 KO was observed for ecto-5’nucleotidase CD73 (Figure 4—figure supplement 3A–B). However, differences in CD39 mRNA expression between WT and MAC-CX43 KO peritoneal macrophages had no impact on kinetics of extracellular ATP degradation by these cells (Figure 4—figure supplement 3C–D). Taken together, CX43 blockade or deletion reduce ATP secretion and its autocrine downstream effects on macrophages via P2Y1. 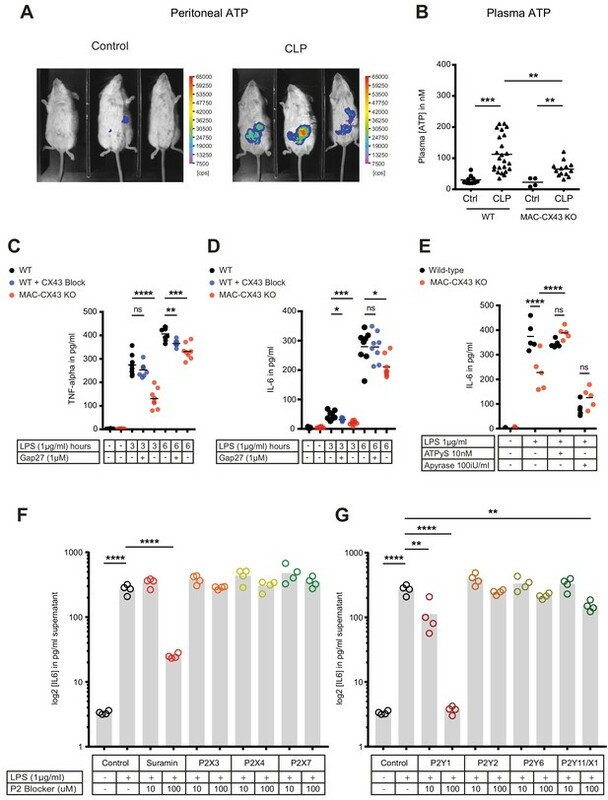 To test the relevance of CX43 for sepsis outcome, we compared our MAC-CX43 KO mice (Lyz2cre/cre, Gja1flox/flox) to mice heterozygous for the lyzozyme two cre sequence (Lyz2cre/wt, Gja1flox/flox) with or without pharmacological inhibition with Gap27 as well as sham operated controls. Murine sepsis score (Supplementary file 1C), weight loss, survival time, bacterial load, and markers of inflammation were monitored. The extent of sepsis, as assessed by the murine sepsis score, was significantly reduced in MAC-CX43 KO compared to WT mice without a difference in weight loss (Figure 5A–B). CLP is a lethal model with a survival time expected to be reached between 18 and 24 hr following surgery. CX43 blocking or specific genetic deletion in CLP operated mice was associated with significantly prolonged survival time compared to control WT C57BL/6 mice (Figure 5C). Bacterial load was not different in both peritoneal fluid and blood excluding altered phagocytosis by macrophages to be relevant (Figure 5—figure supplement 1A–B). Improved survival and decreased local and systemic cytokine secretion in response to Connexin-43 blocking or deletion during abdominal sepsis. (A–B) Clinical outcome using Murine Sepsis Score and weight loss following CLP (N = 5 animals per group, two-way ANOVA). (C) Survival of mice following caecal ligation and puncture (CLP). Mice treated with Gap27 (blue, N = 6 animals), a specific CX43 blocker, homozygous (Lyz2cre/cre, Gja1flox/flox, red, N = 7 animals) and heterozygous cre (Lyz2cre/wt, Gja1flox/flox, red dashed, N = 3 animals) were compared to non-treated WT controls (black, N = 6 animals) (Log-rank (Mantel-Cox) test). (D–G) Systemic levels of TNF-alpha, IL-6, IL-33 and IL-10 in the serum of WT and MAC-CX43 KO mice operated with CLP (each dot is representative of a single animal, Mann-Whitney test). (H–K) IL-6 in peritoneal fluid (PF) serum, lungs, kidney and liver (each dot is representative of a single animal, Mann-Whitney test). Levels are expressed in pg/mg tissue respectively pg/ml of serum or peritoneal fluid. Data are representative of three or more independent experiments. In order to assess if cellular fractions change in MAC-CX43 KO mice compared to WT mice during sepsis, peritoneal cells were characterised by mass and flow cytometry. At baseline, two resident macrophages clusters (LPM) were identified (Figure 5—figure supplement 2A–C). The number of CX43high resident macrophages was higher in the peritoneal cavity of WT mice compared to MAC-CX43 KO mice at baseline, which might be due to low Lyz2 promoter activation during their maturation (Figure 5—figure supplement 2C). LPM disappeared 10 hr after CLP and neutrophils and different clusters of infiltrating SPM were increased in the peritoneal cavity (Figure 5—figure supplement 2D). However, no difference in cell numbers was observed between WT and MAC-CX43 KO mice, indicating that even though macrophages were differently activated, their numbers were not altered by CX43 deletion or blockade. 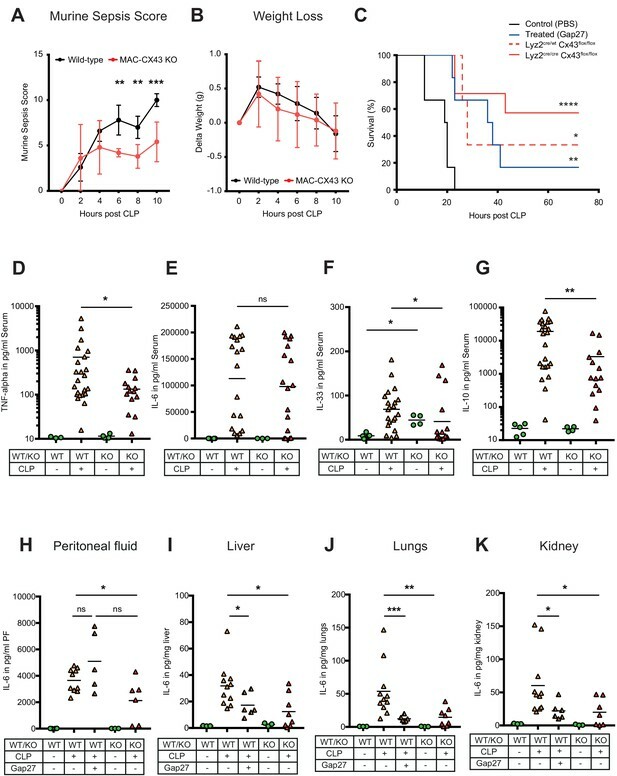 Relative fractions of CD4 and CD8 T cells decreased in septic animals compared to control without difference between WT and MAC-CX43 KO (Figure 5—figure supplement 3A–B). Inflammatory cytokines were assessed systemically (serum), locally (peritoneal fluid), and in key organs typically injured during sepsis (lungs, liver, kidney, intestine). In the serum, we observed decreased levels of pro-inflammatory cytokines (TNF-alpha and IL-33 but not IL-6 and IL-1 beta) in MAC-CX43 KO compared to WT mice 10 hr after CLP (Figure 5D–F, Figure 5—figure supplement 3C). In addition, IL-10 levels were lower, indicating a decrease of both pro- and anti-inflammatory cytokines in MAC-CX43 KO mice (Figure 5G). In the peritoneal fluid and in the peripheral effector organs, we observed decreased IL-6 levels (with the exception of the intestine) of mice with CX43 deletion or blockade compared to non-treated WT mice (Figure 5H–K, Figure 5—figure supplement 3D). A relevant role of neutrophils can be excluded, first, because of limited expression of CX43 in response to sepsis (Figures 2 and 3) and because no alterations of myeloperoxidase activity in the liver of mice 10 hr after CLP was observed in response to CX43 blockade (Figure 5—figure supplement 3E–F). Taken together these data suggest that CX43 regulates the secretion of inflammatory cytokines in an autocrine manner during sepsis by the release of ATP and activation of P2Y1. Following hollow organ perforation, intestinal bacteria penetrate the peritoneal cavity and generate inflammation eventually leading to sepsis (Figure 6). Our data have shown that ATP release from peritoneal macrophages is an active process that occurs in response to TLR-2 and TLR-4 agonists in a CX43-dependent manner. Increased expression of CX43 on macrophages following TLR-4 pathway activation has been previously shown (Qin et al., 2016). Our study has extended this observation by describing the functional role of CX43 for autocrine signalling in macrophages. This is mainly relevant in infiltrating SPM, which are the main CX43-positive population during peritonitis, replacing resident LPM. (1) Following caecal ligation and puncture (CLP), bacteria invade the peritoneal cavity. (2) Bacteria-derived products, for example LPS, interact with TLR-4 to increase CX43 synthesis in a MyD88/TRIF dependent manner and (3) with TLR-4/–2 to induce CX43-dependent ATP release. (4) Extracellular ATP interacts with P2Y1 receptors to increase inflammatory cytokines secretion. Once released in the extracellular space via CX43, ATP typically signals through P2 receptors in an autocrine manner. Among the P2 receptors that have been shown to play a critical role for macrophage activation (Csóka et al., 2015; Greve et al., 2017; Lecut et al., 2012; Maître et al., 2015), we identified the P2Y1 to be critical in a model of abdominal peritonitis. This effect mainly depends on alterations in cytokine secretion while phagocytic capacity was not changed, adding evidence to previous conflicting results on putative purine mediated phagocytosis (Anand et al., 2008; Glass et al., 2013). We have shown that both pharmacologic blockade and genetic deletion of CX43 in activated macrophages led to increased survival compared to controls. This was associated with lower levels of key inflammatory cytokines in the acute phase of sepsis including IL-6, TNF-alpha in response to CX43 blockade or deletion. Decreased levels of IL-10 and IL-33 indicate that blocking CX43 might improve the long-term outcomes, as these cytokines have been shown to be involved in immunosuppression following sepsis (Nascimento et al., 2017). This supports previous data showing that PAMPs and DAMPs interacting with PRRs induce ATP release and finally alterations in cytokine secretion (Cauwels et al., 2014; Sakaki et al., 2013). This effect was inflammasome independent for TNF-alpha and IL-6. Furthermore, the finding that IL-1-beta secretion is not altered via the CX43/P2Y1 axis supports inflammasome independent signalling (Gicquel et al., 2015; Sakaki et al., 2013). P2Y1 purinergic receptors are Gαq-protein coupled receptors signalling via phospholipase Cβ and increased cytosolic calcium levels (Barańska et al., 2017). The function and downstream signalling of P2Y1 has been well described in platelets or neurons but not in macrophages (Hechler and Gachet, 2015). It is likely that downstream signalling of P2Y1 mediated TNF-alpha and IL-6 secretion in macrophages to be dependent on the same mechanisms. CX43/P2Y1 dependent modulation of IL-6 secretion may be partially dependent on TNF-alpha since IL-6-promoter is also activated by TNF-alpha among other stimuli explaining the sequence of appearance during peritonitis (Hunter and Jones, 2015; Jones and Jenkins, 2018). In this study, plasma and peritoneal ATP levels might be underestimated in vivo, since ATP is rapidly degraded by different membrane-bound ecto-nucleotidases (NTPDases 1, 2 and 8) and soluble ecto-nucleotidases (Fausther et al., 2012; Feldbrügge et al., 2018; Yegutkin et al., 2003). 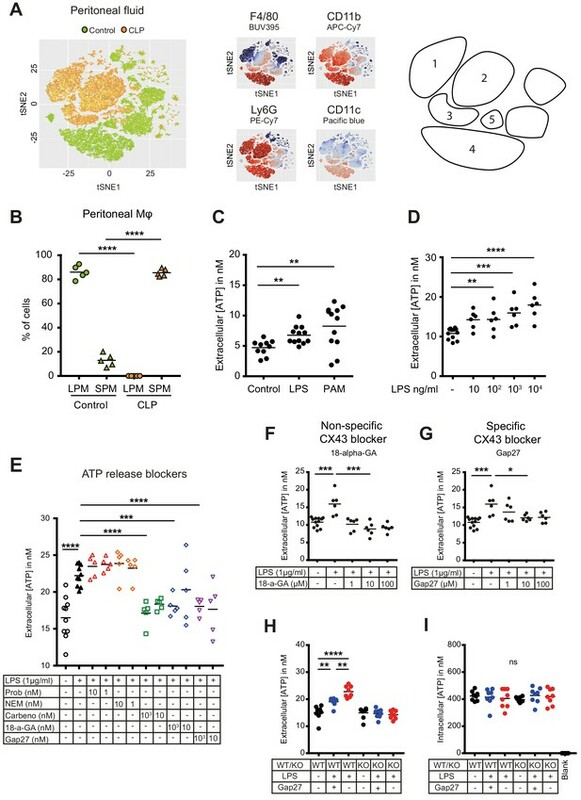 This is supported by the finding that by blocking ecto-nucleotidases, we observed higher ATP levels in the extracellular space of peritoneal macrophages in vitro (Figure 1—figure supplement 1C). Altered purinergic signalling by MAC-CX43 KO peritoneal macrophages resulting in decreased cytokine secretion was reversed by the administration of ATPgammaS or apyrase. Therefore, CX43 may impact on ATP dependent autocrine signalling via activation or desensitisation of purinergic receptors that has been shown for P2Y1 (Gomes et al., 2009; Rodríguez-Rodríguez et al., 2009). The expression of CD39 was disturbed in response to CX43 deletion as seen in other models of inflammation (Deaglio and Robson, 2011). However, altered expression had no impact on the kinetics of ATP hydrolysis in cultured peritoneal macrophages. The effects of CX43 observed in this study are specific for macrophages given the exclusive expression of CX43 on macrophages conversely to neutrophils or lymphocytes. Therefore, we present a novel pharmacological target to address macrophage function specifically. Clinical applicability is substantiated by human data where we identified CX43 positive macrophages in the peritoneal cavity of patients with peritonitis but not in control patients, allowing us to hypothesise that CX43 plays a comparable role in human macrophages and in mouse macrophages. As CX43 proteins form pores that are permeable for other small molecules, typically lower than 1 kDa, the effect on the secretion of other nucleotides, including UDP (Qin et al., 2016), as well as other metabolites could influence sepsis outcome as well. For in vitro experiments, thioglycollate was used to induce recruitment of macrophages to the peritoneal cavity. Thioglycollate-induced exudate macrophages differ from resident macrophages in metabolic activity and phagocytic activity (Pavlou et al., 2017; Shaw and Griffin, 1982). However, given the robust differences between the groups we expect that the findings are applicable to SPM that are the recruited and highly active macrophage population in peritonitis. In conclusion, we identified that CX43 is upregulated specifically on macrophages locally and systemically during sepsis and that the elevated levels of CX43 mediate cytokine secretion but not phagocytosis of macrophages via extracellular ATP and the purinergic receptor P2Y1. Therefore, CX43 is critical for the pathophysiology of sepsis and may be a potential new target for improving the outcome of this critical clinical condition. Peritoneal lavage fluids were collected from patients operated at the Department of Visceral Surgery and Medicine, Inselspital Bern, Switzerland (Supplementary file 1A). Peritoneal lavage fluid was filtered through a 100 µm filter and a Ficoll (GE Healthcare, #17-5442-02) gradient was performed by pipetting 10 ml Ficoll under 40 ml peritoneal lavage fluid in a 50 ml Falcon tube. Tubes were centrifuged (800 g, 4°C, 20 min, no brake). Cells were stained for flow cytometry as described below with anti-human antibodies (Supplementary file 1E). Animals were housed in specific pathogen free (SPF) conditions. Animals used in our experiments were aged between 8 to 12 weeks and were females. WT mice were on C57Bl/6(J) background and were purchased from Harlan, Netherlands. MyD88/TRIF-/- mice and caspase 1/11-/- mice were provided by Andrew MacPherson (Mucosal Immunology, University of Bern) and were bred germ-free at the Clean Mouse Facility, University of Bern, Switzerland. These mice were colonised with SPF flora for experimental purposes. Due to the fact that CX43 is expressed on various cell types including endothelial cells and myocytes in the heart in addition to inflammatory cells, CX43 full KO die perinatally due to cardiac malformation (Eckardt et al., 2004; Liao et al., 2001). In order to develop a cell-specific conditional MAC-CX43 KO mouse model, B6.129P2-Lyz2tm1(cre)Ifo/J mice and B6.129S7-Gja1tm1Dlg/J mice were purchased from Jackson Laboratory (Bar Harbor, ME, USA) and were crossed together. MAC-CX43 KO mice used in our experiments were carrying a floxed Gja1 gene on both alleles and cre enzyme either on both alleles (Lyz2cre/cre, Gja1flox/flox) or on one allele for heterozygous controls (Lyz2cre/wt, Gja1flox/flox). Genotyping of MAC-CX43 KO mice was done according to Jackson protocol and using following primers: Gja1 (Forward primer: 5’ CTTTGACTCTGATTACAGAGCTTAA 3’ and reverse primer: 5’ GTCTCACTGTTACTTAACAGCTTGA 3’) and Lyz2 (Wild-type forward primer: 5’ TTACAGTCGGCCAGGCTGAC 3’, mutant (cre) forward primer: 5’ CCCAGAAATGCCAGATTACG 3’, common reverse primer: 5’ CTTGGGCTGCCAGAATTTCTC 3’). We used caecal ligation and puncture (CLP) to induce peritonitis leading to high-grade sepsis (Rittirsch et al., 2009). In brief, mice were anaesthetised with isoflurane and a longitudinal 1 cm midline laparotomy was performed to expose the caecum. The caecum was tightly ligated using a 6.0 silk suture (6–0 PROLENE, Ethicon) with 2/3 of the caecum included below the ligature and was perforated twice using an 22 gauge needle. The abdomen was closed and mice were subcutaneously injected with 1 ml of 0.9% saline. Sham-operated mice received the same surgical operation without caecum ligation and puncture. No antibiotics were administered to mice that underwent the operation. The mice were sacrificed at 5 and 10 hr for experimental purposes. A separated set of animals, including WT and MAC-CX43 KO, were used in survival studies and were sacrificed latest 72 hr after CLP. All the animals operated with CLP were monitored using a Murine Sepsis Score that was adapted from a previous publication (Shrum et al., 2014) (Supplementary file 1C). Animals were treated with analgesics (buprenorphin) or sacrificed according to their score. Prior to harvesting, mice were anaesthetised using 2 μl/kg mouse body weight of a mixed triple combination of Fentanyl (0.05 mg/ml), Midazolam (5 mg/ml) and Medetomidin (1 mg/ml). Animals were placed on a surgical tray, abdominal skin was removed and laparotomy was performed. Blood was collected from inferior vena cava using a 22 gauge catheter (BD Insyte, #381223) and a 2 ml syringe into 1.5 ml Eppendorf tubes. Blood was incubated at room temperature for 60 min and centrifuged at 1,000 g for 10 min. Supernatant was transferred in a new tube and further centrifuged at 10’000 g for 10 min. Serum was finally collected in a new tube and snap frozen in liquid nitrogen. In order to collect peritoneal fluid, 5 ml ice cold PBS was injected i.p. using a 10 ml syringe and a 23 gauge needle. The abdomen was massaged for 15 s and at least 1 ml peritoneal fluid was collected in Eppendorf tubes. Tubes were centrifuged at 10,000 g for 10 min to pellet cells present in the peritoneal fluid and supernatant was pipetted into a new tube. Both pellets and supernatants were snap frozen in liquid nitrogen for further experiments. Various organs, including liver, lungs, kidney and small intestine were collected and either further processed for flow cytometry analyses or snap frozen in liquid nitrogen for future experiments. Mice were injected i.p. with 2 ml 3% Brewer thioglycollate (Sigma-Aldrich, #B2551) 3 days prior macrophage isolation. In order to collect macrophages, the peritoneal cavity was washed with ice cold harvest medium (Dulbecco’s phosphate-buffered saline without calcium and magnesium supplemented with 3% fetal calf serum, Sigma-Aldrich, #D8537). Collected fluids from at least five different mice were pooled and filtered through 100 µm filter and cells were centrifuged at 800 g and 4°C for 5 min. Erythrocytes were lysed using erythrocyte lysis buffer (Qiagen, #160011922). Cells were counted using a counting chamber and were plated after resuspension in culture medium (Dulbecco’s Modified Eagle Medium/F12 GlutaMAX (ThermoFisher Scientific, Gibco, #10565018) supplemented with 50 IU/ml penicillin G and 50 µg/ml streptomycin and 10% fetal calf serum). HEK293-pmeLUC cells were provided by Francesco Di Virgilio (Department of Morphology, Surgery and Experimental Medicine, University of Ferrara). HEK293-pmeLUC cells were cultured in DMEM/F12 supplemented with 10% fetal calf serum, 50 IU/ml penicillin G, 50 µg/ml streptomycin and 0.2 mg/ml G418 sulphate (Geneticin, Calbiochem). Cells were cultured in 75 cm2 tissue culture flasks (VWR, #734–2313) and kept in the incubator at 37°C and 5% CO2. The viability of cultured cells was checked under the microscope before every cell passage. After detachment of cells using a 0.05% trypsin/EDTA solution (ThermoFisher Scientific, #15400054), cells were counted using a counting chamber (Brand, #717805). 40 × 103 cells were plated on 96-wells transparent flat bottomed cell culture plates (Sarstedt, Tissue culture plate 96-wells, sterile, #83.3924.300) and 1 × 106 cells were plated on 6-wells transparent flat bottomed cell culture plates (Sarstedt, Tissue culture plate 6-wells, # 83.3920.005) for experimental purposes. Extracellular ATP was measured using a luciferin-luciferase assay as described in manufacturer protocol (Biothema, #144–041) and bioluminescence was quantified using a Tecan Infinite 200 plate reader (Tecan). In vitro, the supernatant was collected from 96-wells cell culture plate. The ecto-ATPase inhibitor ARL 67156 (Sigma-Aldrich, #67156) was used to reduce extracellular ATP degradation. In vivo, extracellular ATP was quantified in the peritoneal fluid and in the plasma using the same kit and 1:20 dilution in PBS. Plasma was collected in Eppendorf tubes with CTAD (citrate-theophylline-adenosine-dipyridamole) (BD Vacutainer, #367599) to avoid platelet activation and ATP release via degranulation. Intracellular ATP was quantified in peritoneal macrophages using a luminescent cell viability assay following manufacturer’s protocol (CellTiter-Glo 2.0 Assay, Promega, # G9241). Measurements of extracellular ATP using a chimera plasma-membrane targeted luciferase on HEK293 cells were performed as previously described and by adapting the protocol for our own purposes (Pellegatti et al., 2008; Pellegatti et al., 2005). Cells were cultured as described above. 5 × 106 cells were injected i.p. right after CLP or sham and before suturing the abdominal wall. 6 hr after CLP, 3 mg D-luciferin diluted in 100 µl PBS were injected i.p. Bioluminescence was measured using a gamma camera (NightOWL LB 983, Berthold Technologies) 8 min after D-luciferin injection and is proportional to the amount of ATP present in the peritoneal cavity. As previously described (Csóka et al., 2015), blood and peritoneal lavage fluid were diluted serially in sterile physiologic saline. Fifty microliters of each dilution was aseptically plated and cultured on LB agar or trypticase blood agar plates (BD Biosciences) at 37°C. After 12–16 hr of incubation, the number of bacterial colonies was counted. The number of cultures is expressed as CFUs per millilitre of blood or peritoneal lavage fluid. Total RNA was isolated from tissue by TRIzol reagent and following manufacturer’s protocol (Roche, #11667165001). In the liver, one cubic millimetre of the median lobe was used for RNA isolation. RNA concentration and quality were analysed by spectrophotometer NanoDrop ND-1000 (Thermo Scientific). 500 ng of total RNA was used for cDNA synthesis. cDNA was synthesised by using Omniscript RT Kit 200 (Quiagen, #205113). qPCR analysis was performed by using TaqMan gene expression assays (Applied Biosystem) according to manufacturer’s protocol. mRNA was analysed by reverse transcriptase-quantitative PCR (ABI 7900, SDS 2.3 software). Primers and probes sequences were purchased from Applied Biosystems: Arg1 (Mm00475988_m1), Cd39/Entpd1 (Mm00515447_m1), Cd73 (), Il-10 (Mm00439614_m1), Inos (Mm00440485_m1), Il-12rb2 (Mm00434200_m1), P2r × 1 (forward: 5’ ACTGGGAGTGTGACCTGGAC 3’, reverse: 5’ TCCCAAACACCTTGAAGAGG 3’), P2r × 2 (forward: 5’ CAAAGCCTATGGGATTCG 3’, reverse: 5’ CCTATGAGGAGTTCTGTT 3’), P2r × 3 (forward: 5’ ATTAAGATCGGCTGGGTGTG 3’, reverse: 5’ TCCCGTATACCAGCACATCA 3’), P2r × 4 (forward: 5’ TACGTCATTGGGTGGGTGTT 3’, reverse: 5’ CTTGATCTGGATACCCATGA 3’), P2r × 5 (forward: 5’ GGGGTTCGTGTTGTCTCTGT 3’, reverse: 5’ CACTCTGCAGGGAAGTGTCA 3’), P2r × 6 (forward: 5’ GTGGTAGTCTACGTGATAGG 3’, reverse: 5’ GCCTCTCTATCCACATACAG 3’), P2r × 7var1-3 (forward: 5’ CTTGCCAACTATGAACGG 3’, reverse: 5’ CTTGGCCTTTGCCAACTT 3’), P2r × 7var4 (forward: 5’ TCACTGGAGGAACTGGAAGT 3’, reverse: 5’ TTGCATGGATTGGGGAGCTT 3’), P2ry1 (forward: 5’ TTATGTCAGCGTGCTGGTGT 3’, reverse: 5’ CGTGTCTCCATTCTGCTTGA 3’), P2ry2 (forward: 5’ GAGGACTTCAAGTACGTGCT 3’, reverse: 5’ ACGGAGCTGTAAGCCACAAA 3’), P2ry4 (forward: 5’ AACAACTGCTTCCTCCCT 3’, reverse: 5’ AAGTCCTAGAGGTAGGTG 3’), P2ry6 (forward: 5’ CCTGATGTATGCCTGTTCAC 3’, reverse: 5’ CACAGCCAAGTAGGCTGTCT 3’), P2ry11 (forward: 5’ TGTGGCCCATACTGGTGGTTGAG 3’, reverse: 5’ GAAGAAGGGGTGCACGATGCCCA 3’), P2ry12 (forward: 5’ ATATGCCTGGTGTCAACACC 3’, reverse: 5’ GGAATCCGTGCAAAGTGGAA 3’), P2ry13 (forward: 5’ TGCAGGGCTTCAACAAGTCT 3’, reverse: 5’ CCTTTCCCCATCTCACACAT 3’), P2ry14 (forward: 5’ GGAACACCCTGATCACAAAG 3’, reverse: 5’ TGACCTTCCGTCTGACTCTT 3’). Relative changes in mRNA were calculated with the ΔΔCt method. Ct values of target genes were calculated relative to a reference control gene (Tbp (Mm01277042_m1) and Beta-actin (Actb, Mm00607939_s1)) using the following formula ΔCtTG = CtTG CtRG. Experimental groups are normalised to control group. ΔΔCt=ΔCtexp - ΔCtcon. Fold change = 2-ΔΔCt Log2FC. Proteins were extracted using RIPA Lysis buffer, which volume was adapted for every tissue. Proteins extracted were quantified using Bio-Rad Protein Assay System (Bio-Rad Laboratory, Melville, NY). Protein lysates were boiled in Laemmli buffer, run on BIO-RAD Mini-Protean TGXTM (10–20% Ready Gel Tris-HCl Gel System, 12-well comb #456–1095 and 10-well comb #456–1094) for 90 min at 120 Volt, and transferred on BIO-RAD Trans-Blot Turbo Mini or Midi PVDF membranes (Mini PVDF Transfer Packs #170–4156 and Midi PVDF Transfer Packs #170–4159) by semi dry Transfer (Trans-Blot Turbo Transfer System BIO-RAD). Specific proteins were detected using the following primary antibodies: Connexin-43 (1:850) (Cell Signalling, #3512, RRID:AB_2294590), β-actin HRP-conjugated (1:5000) (Sigma-Aldrich, #2228, RRID:AB_476697). Antibodies were diluted in 5% milk and incubation was done overnight at 4°C. Following secondary antibodies were used: HRP-conjugated anti-rabbit (1:5000) (Dako, #P0448, RRID:AB_2617138). Membranes were then washed and protein expression was analysed by chemiluminescence (Western Lightning Plus-ECL Perkin Elmer), using Fusion-FX (Vilber). CX43 expression in the liver and in the lungs was assessed by immunostaining. In brief, paraffin-embedded tissue sections were dewaxed followed by incubation in antigen retrieval citrate buffer (Sigma-Aldrich, #C9999). Erythrocyte quenching was performed using 3% H2O2 (Dr. Grogg, #K45052100407) diluted in phosphate buffered saline supplemented with 0.05% Tween 20 (PBST). After protein blocking (PBS, 5% BSA), the slides were incubated overnight at 4°C with the primary rabbit anti-CX43 antibody (1:100, Cell Signalling, #3512), followed by incubation with secondary biotinylated anti-rabbit (Dako, #E0432) for 1 hr at room temperature and by incubation with peroxidase labelled streptavidin (Seracare, #71-00-38) for 30 min at room temperature. Liver and lung sections were stained with hematoxylin (MERK, #HX43078349) for 1 min followed by Eosin staining for 6 min. Later, sections were mounted with Eukritt (Kindler, GmbH). Peritoneal macrophages were isolated as described above and plated on a chamber slide for immunofluorescence. After incubation at 37°C for 12 hr, cells were washed using PBS and fixed using 4% formaldehyde solution for 15 min. Specimens were covered with blocking buffer (1X PBS/5% normal serum/0.3% Triton X-100) for 60 min followed by overnight incubation with primary rabbit anti-CX43 antibody (1:100, Cell Signalling, #3512, RRID:AB_2294590). Further, specimens were incubated 120 min with secondary goat anti-rabbit IgG FITC-conjugated antibody (Sigma, #F0382, RRID:AB_259384) and 5 min in Dapi (Sigma, #D9542). Finally, specimens were mounted using Vectashield Antifade Mounting Medium (Vector Laboratories, #H-1000) and covered with a coverslip. Inflammatory cytokines (TNF-alpha, IL-6 and IL-10) were quantified in serum, peritoneal fluid and organs collected in mice following CLP and in control mice, and supernatants from in vitro LPS-stimulated peritoneal macrophages. Uncoated ELISA kits were purchased from Invitrogen (Thermo Fisher Scientific) and ELISA were performed following manufacturer’s protocol: TNF-alpha (Invitrogen, #88-7324-22), IL-6 (Invitrogen, #88-7064-22), IL-10 (Invitrogen, #88-7105-22). Plates were red using Tecan. Serum cytokines were measured using electrochemiluminescence assays (Meso Scale Discovery (MSD), Rockville, Maryland, USA). Serum TNF-alpha, IL-6, IL-10 and IL-33 were measured using a multiplex assay using the V-PLEX Mouse Cytokine 19-Plex kit (MSD). Samples were diluted 1:3 in proprietary buffer (MSD) and measured in duplicate according to manufacture's protocol. Plates were run on MSD plate reader model 1250. Myeloperoxidase assay was carried out as previously described (Fahrner et al., 2014; Mota et al., 2007). Briefly, liver samples were thawed, 50 mg of tissue was weighed out and homogenised in 1 ml of 20 mM phosphate buffer using a TissueLyser (Qiagen) 2 min at 20 Hz, centrifuged at 10,000 g for 10 min, and the pellet was resuspended in 50 mM phosphate buffer (pH 6.0) containing 0.5% hexadecyltrimethyl ammonium bromide. The samples were then freeze-thawed four times using liquid nitrogen followed by a 40 s sonication, centrifuged at 10,000 g for 10 min, and the supernatant was used for the MPO assay. The assay mixture contained 10 µl of the sample, 25 µl 3,3'5,5-tetramethylbenzidine (final concentration 1.6 mM), 25 µl H2O2 in 80 mM phosphate buffer (pH 5.4, final concentration H2O20.3 mM), and 40 µl of 50 mM phosphate buffer (pH 6.0) containing 0.5% hexadecyltrimethyl ammonium bromide. The mixture was incubated at 37°C for 2 min, stopped with the addition of 1 M HCl, and the absorbance was measured at 450 nm. To perform flow cytometry, leukocytes were isolated from the peritoneal cavity and from the liver. Isolation of peritoneal leukocytes was performed as described above by washing the peritoneal cavity with ice cold PBS. Leukocytes isolation from the liver was performed as previously described (Kudira et al., 2016). The liver was cut in small pieces and placed in 10 ml RPMI containing 3% FCS 1 mg/ml collagenase IV and 0.1 mg/ml DNase I (Roche) with shaking at 37°C for 30 min. Cell suspension was passed through a 100 µm cell strainer and washed twice with FACS buffer (PBS, 3% FCS, 2 mM EDTA). Cells were centrifuged (800 g, 7 min, 4°C) and resuspended in 40% Percoll solution and layered on top of 80% Percoll solution. Gradient centrifugation was carried out (900 g, 20 min, 4°C, no brake). Leukocytes were collected from the interphase, washed with FACS buffer and centrifuged (800 g, 7 min, 4°C). Cells were finally resuspended in FACS buffer and further stained for flow cytometry. Aliquots of 106 cells/100 μL of staining buffer per well were incubated each with 1 μg of purified anti-CD16/CD32 for 20 min at 4°C in the dark, in order to block non-specific binding of antibodies to the FcγIII and FcγII receptors. Cell suspension was incubated with a fixable viability dye (AmCyan, eBioscience, #65-0866-14) diluted in DPBS during 20 min at 4°C in the dark to exclude dead cells. Subsequently, these cells were separately stained with the surface markers for 20 min at 4°C in the dark with 1 μg of primary antibodies. For cytokines and transcription factors, cells were stained with antibodies to surface antigens, fixed and permeabilised according to the manufacturer’s instructions (Foxp3/Transcription Factor Staining Buffer Set; eBioscience, 00-5523-00). Fluorescently labelled anti-mouse used are summarised below (Supplementary file 1D). Cells were subsequently washed twice with, and re-suspended in FACS buffer. Finally, cell data were acquired on a LSR II SORP H271 (BD Biosciences). Flow cytometric analysis was done using FlowJo (Treestar). In all experiments, FSC-H versus FSC-A was used to gate on singlets with dead cells excluded using the fluorescence-coupled fixable viability dye. Murine inflammatory peritoneal cells were gated as follow: (1) SPMs: viable (AmCyanlow), CD45high, CD3 and CD19low, Ly6Glow, F4/80int and CD11bint (2) LPMs: viable (AmCyanlow), CD45high, CD3 and CD19low, Ly6Glow, F4/80high and CD11bhigh (3) Neutrophils: viable (AmCyanlow), CD45high, CD3 and CD19low, Ly6Ghigh, F4/80low and CD11blow (4) Dendritic cells: viable (AmCyanlow), CD45high, CD3 and CD19low, Ly6Ghigh, F4/80low, CD11blow and CD11chigh. Liver macrophages were characterised as published previously (You et al., 2013). Inflammatory cells in the liver were gated as follow: AmCyanlow, CD45high, CD3/CD19low. Human peritoneal macrophages were gated as follow: AmCyanlow, CD45high, CD3low, CD19low, CD56low, CD11clow, CD16high and CD67low. For time-of-flight mass cytometry (CyTOF) experiments, cells were isolated from the peritoneal cavity as previously describe (Ray and Dittel, 2010), 3 × 106 cells were stained with lanthanide-conjugated antibodies as previously described (Becher et al., 2014). Antibodies were purchased already labelled or labelled using the MaxPar antibody labelling kit (Fluidigm, Supplementary file 1F). Raw signals were normalised to median bead intensity using four elemental calibration beads (Fluidigm) as previously described (Finck et al., 2013). The Live intact single events were gated for their DNA content (MaxPar Intercalator, Ir 193) and viability (Cell-ID Cisplatin, 198 Pt). CD45neg cells were excluded. Analysis was done using t-SNE for dimensionality reduction on arc sinus transformed data (Hinton, 2008). On t-SNE plots the clusters were manually gated based on their marker expression. The phagocytic capacity of plated peritoneal macrophages was assessed as described in the manufacturer protocol (Cayman Chemical, #500290). Peritoneal macrophages were isolated from WT and MAC-CX43 KO mice as described above. 50’000 macrophages were plated per well on a chamber slide (Nunc Lab Tek II, #154534) and incubated for 12 hr at 37°C and 5% CO2. Macrophages were primed or not with LPS 1 µg/ml for 4 hr and exposed or not to FITC latex beads coated with rabbit IgG diluted 1:200 for 2 hr (four groups in total). Negative controls were incubated on a separate slide chamber at 4°C. Toll-like receptors 4 and 2 agonists were used to stimulate peritoneal macrophages in vitro: lipopolysaccharides (LPS) from E.coli O111:B4 (Sigma-Aldrich, # L4130) and Pam3CSK4 (Invivogen, # tlrlpms). In order to block ATP release via hemichannels, 18-alpha-glycyrrhetinic acid (Sigma-Aldrich, # G8503) was used as a nonspecific inhibitor of connexin channels and Gap27 (Tocris Bioscience, # 1476) was used as a specific CX43 inhibitor. 18-alpha-glycyrrhetinic acid was dissolved in DMSO to obtain a solution 20 mg/ml as described in supplier protocol. The final DMSO concentration in the supernatant was 0.25%. Probenecid (Sigma-Aldrich, # P8761) was used as a specific pannexin-1 inhibitor and carbenoxolone (Sigma-Aldrich, # C4790) as a non-specific inhibitor of connexin and pannexin channels. The following purinergic agonists and antagonists were used: ATPgammaS (Jena Bioscience, # NU-406–50), apyrase (Sigma-Aldrich, # A6132), suramin (non-selective P2 antagonist, Tocris, # 1472); NF110 (P2 × 3 antagonist, Tocris, # 2548); 5BDBD (P2 × 4 antagonist, Tocris, # 3579); A804598 (P2 × 7 antagonist, Tocris, # 4473); MRS2500 and MRS2279 (P2Y1 antagonist, Tocris, # 2159 and # 2158); AR-C 118925XX (P2Y2 antagonist, Tocris, # 4890); MRS2578 (P2Y6 antagonist, Tocris, # 2146); NF157 (P2Y11/P2 × 1 antagonist, Tocris, # 2450). 5-BDBD, A804598, AR-C 118925XX and MRS2578 were dissolved in DMSO to obtain a solution 50 mM as described in supplier protocol. The final DMSO concentration in the supernatant was 0.2%. Survival statistics were determined by the Kaplan-Meier curve and log-rank test. t-test, Mann-Whitney test and ANOVA were used to assess the significance of the differences in the means of the different populations. When necessary for ANOVA, p-values were corrected for multiple comparisons using Turkey correction. Statistical tests were performed using Prism six software (GraphPad Software). Levels of significance were assessed with specifically indicated tests and p-values are presented as follows: ns p non-significant; *p<0.05; **p<0.01; ***p<0.001 and ****p<0.0001. Sample size calculation was performed prior to experiments on ClinCalc.com using statistical methods described in a previous publication (Rosner, 2011). t-SNE visualizations were produced with R-package Rtsne on arc sinus transformed data (Van Der Maaten and Hinton, 2008). All human studies were approved by the Ethical Commission of the Canton Bern and written informed consent was obtained from all patients. Peritoneal fluid collection at the beginning of an operation was included in a larger clinical trial, whose protocol is published on ClinicalTrials.gov (NCT03554148, Study ID Number: Bandit). Animal experiments were planned, carried out and reported in agreement with current 3R and ARRIVE guidelines (Kilkenny et al., 2010) and approved according to Swiss animal protection laws by the Veterinary Authorities of the Canton Bern, Switzerland (license no. BE 4/15). The Journal of Immunology 181:8534–8543. 71–89, P2Y1 Receptors – Properties and Functional Activities, Advances in Experimental Medicine and Biology, Springer. Cell Death & Disease 5:e1102–e1107. Sepsis-induced immune dysfunction: can immune therapies reduce mortality? Journal of Clinical Investigation 126:23–31. International Journal of Molecular Sciences 19:1222. Journal of Molecular and Cellular Cardiology 36:101–110. American Journal of Physiology-Gastrointestinal and Liver Physiology 302:G447–G459. The Journal of Immunology 190:4830–4835. American Journal of Physiology-Regulatory, Integrative and Comparative Physiology 297:R940–R949. Frontiers in Cellular and Infection Microbiology 7:113. Arteriosclerosis, Thrombosis, and Vascular Biology 35:2307–2315. Journal of Thrombosis and Haemostasis 10:453–465. Journal of Clinical Investigation 128:3583–3594. The Journal of Immunology 194:739–749. British Journal of Pharmacology 151:998–1005. Journal of Inflammation, 14, 10.1186/s12950-017-0151-x, 28203119. Molecular Biology of the Cell 16:3659–3665. The Journal of Immunology 196:1790–1798. Journal of Visualized Experiments, 10.3791/1488, 20110936. New England Journal of Medicine 377:414–417. British Journal of Pharmacology 158:1609–1620. Journal of Machine Learning Research. Thank you for submitting your article "Connexin-43-dependent ATP release mediates macrophage activation during peritonitis" for consideration by eLife. Your article has been reviewed by three peer reviewers, including Jos van der Meer as the Reviewing Editor and Reviewer #1, and the evaluation has been overseen by Tadatsugu Taniguchi as the Senior Editor. The following individual involved in review of your submission has agreed to reveal their identity: Gennady Yegutkin (Reviewer #2). 1) It convincingly demonstrates the role of CX43 after TLR stimulation and its role in ATP release and cytokine production. 2) The use of mice (a conditional MAC-CX43 KO mouse, in which CX43 was specifically deleted on macrophages and neutrophils; cecal ligation and puncture) and the validation in humans with peritonitis is adequate. 3) It demonstrates the kinetics of the mononuclear phagocytes and the systemic activation in remote organs (liver and lung). 4) The interventions (both pharmacological and genetic) are well in place and lead to the pivotal role of the purinergic receptor P2Y1. The findings provide evidence that CX43 is critical for the pathophysiology of sepsis and may represent a new potential new target for improving the outcome of this critical clinical condition. 1) The experiments in WT, as compared with MAC-CX43 KO mice, revealed massive ATP release via CX43 channels. This should be accompanied by partial depletion of cellular ATP stores or alternatively, CX43-positive macrophages are characterized by higher ATP turnover rate. The former possibility can be tested experimentally, by comparing total intracellular ATP levels in resting versus LPS-stimulated WT and MAC-CX43 KO macrophages, and also in exudate versus resident peritoneal macrophages. 2) ATP released in the extracellular space was shown to be promptly degraded by ecto-nucleotidases, as higher levels of extracellular ATP were observed in the presence of ecto-ATPase inhibitor ARL67156 (Figure 1—figure supplement 1C). Along with NTPDase1/CD39-positive macrophages, other ecto-nucleotidases contribute to the metabolism of ATP in the tissues. For instance, in the liver, NTPDase2 and NTPDase8 are reportedly expressed on portal fibroblasts and bile canaliculi (Fausther et al., 2012; Feldbrügge et al., 2018). Moreover, the presence of soluble ATP-inactivating enzymes freely circulating in the bloodstream (e.g. nucleotide pyrophosphatase/ phosphodiesterase-1 (NPP1): Yegutkin et al., 2003) may lead to the underestimation of actual ATP levels measured in the systemic circulation (and probably, in the peritoneal cavity as well). These alternative and auxiliary inactivating pathways should be mentioned in the text discussed accordingly. 3) Data on markedly down-regulated CD39 mRNA levels in Gap27-treated and CX43-KO LPS-stimulated macrophages (Figure 4F) are interesting but somehow surprising. What might be the mechanism underlying this decrease: does it mean that CD39 expression is regulated by extracellular concentrations of the available ATP substrate? Please, amend or clarify. These data should also be ascertained using direct bioluminescent enzymatic assay and measuring the rate of exogenous ATP decay in control versus treated cells. 4) In the second paragraph on ATP release via CX43 and MyD88/TRIF, the conclusion is that CX43 is responsible for ATP-release via MyD88/TRIF. However, although the authors show that CX43 expression is lower in MyD88/TRIF KO mice, they do not show that ATP release is downregulated in these cells, and therefore one cannot draw this conclusion based on the available data. Did the authors include an experiment in which ATP release of MyD88/TRIF KO cells was measured, thereby linking the two observations? 5) Figure 2F shows that CX43 protein expression in primary murine macrophages is induced by LPS. Perhaps, higher quality/resolution/magnification images would be helpful for better visualization of CX43 staining pattern and subcellular localization in the treated macrophages. Along with the merged image, the authors should provide single channel stainings for Texas Red-labelled CX43 and FITC-labelled macrophages, maybe by showing the representative images only for control cells and those stimulated with LPS for 5 hours. 6) It is unclear to the reviewers how all the ex-vivo/in-vitro experiments with mouse peritoneal macrophages were conducted; it is not clarified in the figure legends or Materials and methods. Is each dot representing 1 mouse? Were all the mouse cells pooled? Why the experiments not conducted in a paired manner using cells from 1 mouse in the different conditions? How many cells were seeded per well? In the same vein, which cells are used is not always specified. What for example does% parents mean in Figure 3F? Such details are important for potential repeating and understanding the figures. 7) Why were the peritoneal macrophages isolated using thioglycollate? This changes the phenotype of the macrophages tremendously. As it is a potent oxygen scavenger, results should be interpreted with caution if ROS production plays a role. This should be discussed at least in the Discussion. 8) Looking at Figure 1, in panel C-F, the control group (which should be the same experiment all the time) shows a mean ATP release of 5, 10, 16 and 10 nM respectively. Can the authors explain this? Again, the difference could not be understood from the methods, as they were lacking. 9) In Figure 1E and F and also Figure 4G and H: solvent controls are missing. Some of the used inhibitors are dissolved in water and do not need a solvent control, but many are not dissolvable in water (such as 18-alpha-glycyrrhetinic acid (chloroform or DMSO), carbenoxolone (in NaOH), P2X4, P2X7 and P2Y2-inhibitors (in DMSO)). How were the inhibitors dissolved and did the authors include solvent controls? 10) In Figure 3A, the authors state to have used the same controls for the two western blots. The control blots look very different to me however. Can the authors comment on this? Furthermore, the authors state that CX43 was expressed on cholangiocytes, but the data are missing. Also, they mention Figure 3F twice, stating it shows different things. Is there a figure panel missing? Finally, again in this paragraph, they draw a conclusion which cannot be made on the available data. CX43 is indeed expressed in the liver and lungs as remote target organs, as they show. However, there is no data showing that CX43 is not expressed in other organs. Therefore, the conclusion that CX43 is specifically expressed in these organs is misleading. 11) Where the authors studied the expression of pro-inflammatory cytokines, they state some results, which the figures do not confirm. For example, the authors state that Gap27 decreases pro-inflammatory cytokine levels TNF-alpha and IL-6, but only IL-6 is decreased, whereas TNF-alpha is not. The same holds true for ATPgammaS reverting the CX43 blockade: TNF-alpha is not downregulated upon the knockout or Gap27 inhibition, and ATPgammaS does not revert this phenotype, since it is simply absent. Finally, in the assessment of systemic cytokines, again the authors state that IL-6 is decreased, but the data do not support this conclusion. 12) How CX43 expression enhances TNF and IL-6 production does not become clear. Is this transcriptional or translational? In addition, isn't the IL-6 not just secondary to TNF? This should at least be discussed if not further supported by experimental data. 13) In line with the previous comment: there is quite some literature (especially Anna Rubartelli's work) showing the role of ATP in the release of IL-1beta out of the macrophage. Since IL-1beta is another deleterious cytokine acting in concert with TNF, but only partially secondary to TNF production, it is a missed chance that the investigators did not include IL-1beta measurements and include the dynamics of that cytokine. 14) What is missed in the Discussion is a more crisp description on the sequence of events, starting with the entry of bacteria in the sterile peritoneal cavity. 15) The description of the mononuclear phagocytes is confusing: infiltrating monocytes, monocyte-derived macrophages, monocytes, small macrophages, resident peritoneal macrophages, primary peritoneal macrophages. Conceptually, when a bacterial challenge in the peritoneal cavity occurs is that resident macrophages do the first job. Directly followed by the rapid neutrophil response and the slower influx of monocytes (which become exudate macrophages). The term primary macrophages for thioglycollate-induced exudate macrophages is confusing. We thank the reviewers for raising this important question. Therefore, we quantified both extracellular and intracellular ATP with or without LPS stimulation in WT and MAC-CX43 KO peritoneal macrophages. Extracellular ATP levels upon LPS stimulation were elevated in the extracellular space in WT but not MAC-CX43 KO peritoneal macrophages (new Figure 1H). No differences of intracellular ATP contents were observed (new Figure 1I). We conclude that alterations of extracellular ATP levels are not associated with depletion of intracellular ATP, since the fraction of ATP released from LPS-stimulated WT peritoneal macrophages represent only between 4 to 6% of the total (intra- and extracellular ATP content (new Figure 1—figure supplement 1E). Thus, a slight elevation of intracellular ATP synthesis most likely immediately compensates for the released ATP. We now discuss this important aspect in the Discussion (fourth paragraph), where we describe the impact of different ecto-ATPases on the systemic and local levels of ATP. This information further strengthens our observation given the possibility of underestimation of measured ATP. As suggested by the reviewers, we performed a functional assay to show extracellular ATP decay in WT compared to MAC-CX43 KO peritoneal macrophages (Figure 4—figure supplement 3C-D). First, we stimulated peritoneal macrophages in vitro for 3 and 6 hours using LPS to induce CD39 expression. Second, we exposed cells to a solution of 100 µM ATP and quantified the bioluminescent enzymatic signal of a luciferin-luciferase reaction proportional to ATP concentration. We observed a decrease of ATP concentration with time in WT and MAC-CX43 KO peritoneal macrophages (Figure 4—figure supplement 3C-D). The kinetics of ATP hydrolysis was not different between WT and MAC-CX43 KO peritoneal macrophages (Figure 4—figure supplement 3C-D). Thus, the difference of CD39 mRNA levels between WT and MAC-CX43 KO peritoneal macrophages seems not to have an impact on extracellular ATP degradation from these cells. The change of expression is potentially the result of autocrine activation in response to elevated levels of pro-inflammatory cytokines secreted by WT macrophages (Deaglio and Robson, 2011). Either, such altered expression does not result in decreased functional CD39 on the cell surface or other ecto-nucleotidases compensate for the decrease of CD39 in the context of CX43 inhibition. As suggested by the reviewer, we now performed an experiment to test LPS-induced ATP release from peritoneal macrophages isolated from MyD88/TRIF KO and WT mice. MyD88/TRIF KO mice and the WT controls were colonized with SPF flora as indicated in the Materials and methods (subsection “Experimental animals”). We observed LPS-induced ATP release from WT but not from MyD88/TRIF KO peritoneal macrophages (Figure 2H). These results support our hypothesis that expression and function of CX43 depends on MyD88/TRIF mediating ATP release in response to LPS. We now included images at a higher magnification in the supplemental data to allow a better subcellular localisation of CX43 protein in macrophages (new Figure 2—figure supplement 1A). After transcription in the nuclei and translation in the endoplasmic reticulum (ER), CX43 is inserted in the ER membrane, where protein folding and post-translational modifications occur (Epifantseva and Shaw, 2018). After transition through the Golgi network, CX43 proteins are delivered to their target location including the plasma membrane. Importantly, CX43 proteins have a short half-life and are rapidly synthetized and delivered to cellular subdomains (Epifantseva and Shaw, 2018). This explains the strong CX43 expression in the ER and the Golgi. Single channel stainings for Texas Red-labelled CX43 and FITC-labelled F4/80 were at the indicated time points are now included (new Figure 2—figure supplement 1B). The details about in vitro experiments have now been extended in the Materials and methods (subsection “Isolation and culture of mouse peritoneal macrophages”): Peritoneal macrophages were isolated after pre-treatment using 3% Brewer thioglycollate. Cells from at least 5 different mice were pooled. Pooling was necessary due to the relative low amount of cells obtained per mouse. Thereby, we obtained reasonable amounts of cells to perform the experiments and while reducing the number of animals according to current 3R guidelines. For the same reason, experiments were not conducted in a paired manner. A total number of 40x103 cells were seeded per well of a 96-well plate and 1x106 cells per well of a 6-well plate. For in vitro experiments, a dot is representative of an independent well, as indicated in the figure legends (Figure 1C-H, Figure 4C-E, Figure 4G-H, Figure 1—figure supplement 1C-E, Figure 1—figure supplement 2B, Figure 4 —figure supplement 1A-E, G, Figure 4—figure supplement 2A-C, Figure 4—figure supplement 3A-B). In Figure 4—figure supplement 3C-D, each dot is representative of 5 independent wells. All experiments have been repeated at least three times. The% of parents in Figure 3F represents percentage of CX43 positive cells for the indicated parent population as detailed in the panel 1, 2 or 3 of Figure 3D. Therefore, the CX43 positive cell fraction of the population identified in 3E is shown. We agree that peritoneal macrophages isolated from the peritoneal cavity after pre-treatment using 3% Brewer thioglycollate differ from in vivo resident and infiltrating peritoneal macrophages. However, under non-elicited conditions the number of macrophages present in the peritoneal cavity is too low to allow the in vitro experiments we performed. Macrophages isolated from the peritoneal cavity of CLP-operated mice showed high levels of apoptosis in culture and could not be used for in vitro experiments. Thioglycollate has been extensively used to isolate in a standardized fashion a reasonable amount of macrophages for cell culture and in vitro experiments to assess responses in models of sepsis (Davies et al., 2013; Ghosn et al., 2010). Main differences of thioglycollate-elicited peritoneal macrophages to resident peritoneal macrophages, are the metabolic activity and elevated phagocytic activity (Pavlou et al., 2017). It has also been shown in an old study that thioglycollate-elicited peritoneal macrophages are less efficient than resident macrophages in antibody-dependent cell-mediated cytolysis (Shaw and Griffin, 1982). It cannot be excluded that these functions of macrophages as well as ROS production may have been missed in our experimental setup. However, the main findings we observed were differences in cytokine responses that were observed both, in vivo and in vitro. We now address these points in the Discussion (seventh paragraph), where limitations of our methods are discussed. Each experiment with primary cells was always performed at once and in parallel. The different figures represent individual sets of experiments that were repeated at least three times (Figure 1C-G more than 5 times). The differences in-between different sets of experiments may be explained by the extensive protocol that includes multiple steps. This may result in potential differences of viability and consequential altered functionality of cells that then add up to these experiment inherent variabilities we have observed. All efforts to standardize such as using a haematocytometer, controlling of pipetting and temperatures were undertaken to eliminate such bias. Furthermore, ATP release is very sensitive to any stimulus and may be elicited via other mechanisms such as vesicular exocytosis that may additionally explain the differences. Importantly, the differences between experimental conditions remained within each experiment despite such differences in baseline levels. DMSO was used to dissolve water-insoluble 18-alpha-glycyrrhetinic acid and P2 receptors inhibitors. Carbenoxolone was dissolved in distilled water according to manufacturer’s recommendations (Sigma-Aldrich, # C4790). In order to control the impact of DMSO on ATP release, we repeated the experiments using with and without DMSO in WT peritoneal macrophages (new Figure 1—figure supplement 1D). Therefore, peritoneal macrophages were isolated from the peritoneal cavity after thioglycollate pre-treatment as previously described, and exposed to LPS to induce ATP release. In this experiment, DMSO was used at a higher concentration (1%) than the concentration used to dissolve our inhibitors (0.25% for 18-alpha-glycyrrhetinic acid, 0.2% for the purinergic receptors antagonists 5-BDBD, A804598, AR-C 118925XX and MRS2578). We now described precisely solvent used in the Materials and methods (subsection “Compounds”). - Controls for the two western blot: We apologize to the reviewer for the lack of clarity in the presentation of our western blot results. We include in our resubmission a source data file where the reviewer can refer to the full uncut gels. On the gels we had separate controls, these were however, both quantified and included in the histogram on the right side of Figure 3A. Thus there are 6 controls quantified in the histogram and 6 for each time point. We changed the legend of Figure 3A to describe that controls are different for each experiment but plotted together in the histogram. - Expression on cholangiocytes: Hepatocytes do not express CX43 under normal conditions (Figure 3B and Figure 3—figure supplement 1A). In our immunohistochemistry staining for CX43 in the liver, we observed CX43 expression on the apical surface of cholangiocytes in livers from control and CLP mice (Figure 3B and Figure 3—figure supplement 1A). This finding is in line with previous data where CX43 has been shown to be expressed on cholangiocytes playing a role in the modulation of bile secretion (Bode et al., 2002; Nathanson et al., 1999). In addition, CX43 is expressed on Kupffer cells, stellate cells and sinusoidal endothelial cells (Maes et al., 2015). - Figure 3F is showing results from the liver and not from the lungs. Results in the lungs are presented in Figure 3G and H. The text was corrected accordingly (Results, subsection “Connexin-43 expressing macrophages are recruited systemically during peritonitis”. - CX43 expression is increased in the liver and lungs upon CLP. It is correct that we do not show results from other organs in which it might also be increased during sepsis. By specifically, we alluded to CLP. This sentence has now been adjusted accordingly (Results, subsection “Connexin-43-mediated local and systemic ATP release contributes to macrophage over-activation via P2Y1”). - The impact of CX43 blocking using Gap27 or CX43 deletion on the secretion of pro-inflammatory cytokines from peritoneal macrophages in vitro is presented in Figures 4C and 4D. CX43 deletion decreased secretion of TNF alpha after 6 hours (Figure 4C) and IL-6 after 3 hours (Figure 4D) of LPS stimulation compared to WT peritoneal macrophages. These findings are now described more precisely in the text (Results, subsection “Connexin-43-mediated local and systemic ATP release contributes to macrophage over-activation via P2Y1”). - We agree with the observations of the reviewers. Only the secretion of IL-6 is altered in response to ATPgammaS. The text was adjusted accordingly (Results, subsection “Connexin-43-mediated local and systemic ATP release contributes to macrophage over-activation via P2Y1”). Also the interpretation of the results of Figure 5E (in vivo levels of IL-6) were adjusted according to reviewer’s observations (Results, subsection “Improved survival and decreased local and systemic cytokine secretion in response to Connexin-43 blocking or deletion during abdominal sepsis”). It has been shown that extracellular ATP exhibit pleiotropic effects via different purinergic receptors finally leading to altered TNF-alpha and IL-6 signaling in macrophages (Cauwels et al., 2014; Sakaki et al., 2013). The function and downstream signaling of P2Y1 has been well described in platelets or neurons but not in macrophages (Hechler and Gachet, 2015). P2Y1 purinergic receptors are Gαq-protein coupled receptors that activates phospholipase Cbeta leading to increased cytosolic calcium levels (Barańska et al., 2017). Thus, downstream signaling of P2Y1 mediated TNF-alpha and IL-6 secretion in macrophages is potentially also dependent on these mechanisms (Hunter and Jones, 2015; Jones and Jenkins, 2018). A parallel induction of TNF-alpha and IL-6 transcription following PRRs-dependent TLRs activation given the different transcription factors that regulate IL-6, including NFkappaB, AP-1, SP1, NF-IL-6 and IRF1. As the IL-6 promoter is activated via stimulation by different signals including TNF-alpha it is possible that differences observed in IL-6 levels are a downstream consequence of TNF alpha regulation. This is now mentioned in the Discussion (third paragraph). We thank the reviewers for their comment and we included our IL1-beta results in the supplemental data (Figure 5—figure supplement 3C, Results, subsection “Improved survival and decreased local and systemic cytokine secretion in response to Connexin-43 blocking or deletion during abdominal sepsis”). We observed increased IL1-beta levels in the serum of CLP-operated mice compared to controls, but no difference between WT and MAC-CX43 KO mice. We address this point, commenting on the storyline of the paper. - In order to improve the clarity of the storyline and to guide the readers through the text, we included a graphical Abstract for the re-submission. - We also include a clear description of the sequence of events in the Discussion part. - Figure supplements are numbered according to their order of appearance in the text. Because supplemental figures outnumber main figures the numbers do not correspond. In the manuscript, macrophages isolated from the peritoneal cavity without stimulation are described as large and small peritoneal macrophages (LPM and SPM) according to the literature (Ghosn et al., 2010; Wang and Kubes, 2016). LPM are resident macrophages present in the peritoneal cavity and inducing the first response to pathogens (Wang and Kubes, 2016). We observed that in our model of peritonitis, resident LPM are quickly replaced by blood-derived infiltrating SPM which is supported by previous observations (Wang and Kubes, 2016). In addition to primary LPM and SPM, thioglycollate elicited peritoneal macrophages were isolated for experimental purposes. The description of macrophages in the manuscript was standardized as follows: (1) Large peritoneal macrophages (LPM) represent resident peritoneal macrophages (2) Small peritoneal macrophages (SPM) represent infiltrating macrophages and (3) Thioglycollate elicited peritoneal macrophages are termed peritoneal macrophages throughout the manuscript. Other descriptions including infiltrating monocytes, monocyte-derived macrophages, monocytes and primary peritoneal macrophages are omitted. The authors would like to thank collaborators from the Laboratory of Visceral and Transplantation Surgery, Department for BioMedical Research, University of Bern for technical assistance. Mass cytometry was performed at the Cytometry Facility of the University of Zurich. Human subjects: All human studies were approved by the Ethical Commission of the Canton Bern and written informed consent was obtained from all subjects. Peritoneal fluid collection at the beginning of an operation was included in a larger clinical trial, whose protocol is published on ClinicalTrials.gov (NCT03554148, Study ID Number: 2017-00573). Animal experimentation: Animal experiments were planned, carried out and reported in agreement with current 3R and ARRIVE guidelines (Kilkenny et al., 2010) and approved according to Swiss animal protection laws by the Veterinary Authorities of the Canton Bern, Switzerland (license no. BE 4/15). © 2019, Dosch et al.